It was a bit hard to label in the picture but the little spattering of snow you see drifting down the screen is more important than it looks as it shows you how hard the wind is blowing and in which direction. The strength and direction of the wind affects the flight of your snowballs so it is a good habit to glance up from scanning for targets every now and then to check on it. 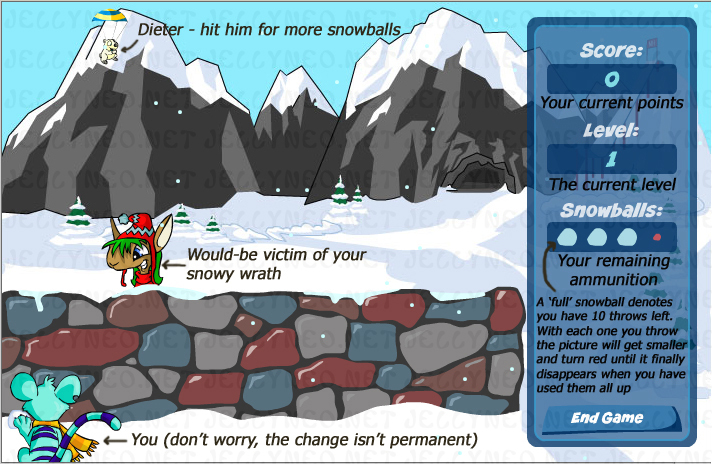 While the wind doesn't really have very much affect on the snowballs you throw at targets that pop up over the wall, it plays a bigger role when you start chucking them at Dieter. But we shall get to that little fellow later, for now we shall focus on the little beggars who taunt you to try and hit them. Not everybody that sticks their face over the wall is fair game to get a snowball in their chops, however much they seem to be asking for it. Any of these guys are fair game; they will pop up from behind the wall at random and hover to and fro for a few seconds before disappearing from view again. At the beginning of the game they will hang around for a good few seconds, but as you get into later levels they pop up and then vanish much faster. If you manage to hit them directly in the face then you will earn yourself 10 points, however if your aim is a little off but you still manage to hit them then you will be awarded 5 points instead. Keep an eye out for the Meepits; they're a smaller target and so harder to hit but a direct hit on them will give you 20 points, with an indirect hit earning you 10 points. Now you're not allowed to hit these two. Why? Well I guess because Illusen is nice and helps Meridell out in times of war and the Soup Faerie is kind to the poor and needy. For the purposes of this game they are rather like the little kids who live next door; they want to stand around and be nosey and join in, but you're not allowed to actually hit them. Hitting either of the faeries will cost you 10 of your precious snowballs, if you don't have 10 snowballs to forfeit then it's game over for you! You might occasionally come across the great Ollie (in a santa hat) popping up with the rest. The chances of him appearing are about 1:1000, so don't waste time waiting for him! A direct hit will net you 50 points while an off-target hit awards 25 points. Okay well not quite. As already stated, if you hit a faerie then it will cost you dearly in snowballs. But thankfully there is a way of earning more. Every now and then Dieter the Polarchuck will parachute down out of the sky and if you can hit him then an extra 10 snowballs will magically be added to your reserves. Hitting him requires a little bit of skill though as you will need to take into consideration the direction and strength of the wind to get your snowball to arc just right to hit him. With a little practice you should get the hang of that though and then it's just a matter of waiting for him to appear when you find yourself running low on ammunition. (You will notice that the screen will completely clear of pets popping up and down for a second just before he appears; it's not much of a warning but it can give you a chance to stop hurling snowballs in time to look for him). There aren't actual levels in the game so much as a steady increase in difficulty as you progress. With each set of 50 points that you amass the 'level' counter goes up; as it increases the pets appear and disappear much more rapidly and move faster up and down the wall. One thing that works in your favour, though, is that there is no time limit in the game so you can spend as long as you need to waiting for a pet to pop up in a position where you can aim and hit them before they vanish. It's also alarmingly easy later on in the game to get a bit trigger happy and fling snow at anything that moves, leading to a few unhappy faeries with snowball remnants on their faces. So the best advice would be to take your time; things might be leaping up and down all over the place but try to focus only on the ones you can realistically hit and ignore the rest. And if all else fails, you can type in snowghettiandmeatball to gain an extra 10 snowballs at any point during your game (although this can only be used once per game and only when you have 40 or less snowballs remaining). That's about it really; but before I leave you to it there are a few Easter eggs I feel I must share with you! On the main game screen you will notice an odd little orange smudge between the 'H' and the 'T' of the title. Click on it and the awesome Ollie will come hurtling down the ski jump and land head-first in the snow. Also if you leave the screen open for a while an angry-sounding Snow Beast will come wandering out of the cave and prowl across the screen. That's about all there is to say about this game. Now, go forth and conquer!